With the ever-increasing competition in the Fintech landscape, investors are seeking ways to make meaningful investments. The market for this new revolution has always been diverse, unique, and unconventional. According to global reports, Fintech has experienced a sudden decline from $46.7 to $24.7 billion within a span of one year, i.e. 2015 to 2016. While these reports narrate one half of the story, some of the other stats reflect a different side. It’s pretty clear that Fintech offers a host of possibilities to investors. However, they have to be careful and invest in areas which aren’t yet saturated. If you wish to make meaningful investments and leverage available resources, it would be imperative to tap into profitable channels. From innovative startups and tech giants to traditional institutions, every single business entity is vying for attention thus grabbing significant market share. Governments of various countries are also trying hard to enforce regulations on Fintech. In a nutshell, it is crucial to identify the avenues that change the face of Fintech and help you make the most of your resources. Gaining profound information about user behavior will benefit the Fintech industry to a great extent. 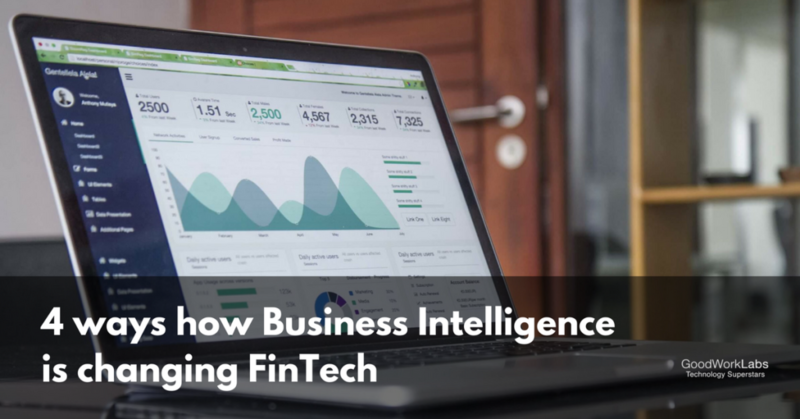 Since Business Intelligence helps you track and monitor user behavior, you will have the opportunity to make the right investments. Most importantly, data analysis can assist in the decision-making process thus helping you devise useful strategies. Some of the leading robot-advisor startups like ‘Betterment’ and ‘Wealthfront’ disrupted investments by leveraging Business Intelligence. When it comes down to making investments, it becomes imperative to understand the market and its specific trends. That’s what Business Intelligence helps you do, thus eliminating chances of making wrong moves and taking improper decisions. We have seen many instances in the past where breaching the security encryption for a FinTech company data isn’t a big deal for notorious fraudsters. Business Intelligence strengthens security and enables successful behavioral analytics. As a result, fraudulent behaviors are easily tracked and investments are less likely to get laundered. Tech firms gain a competitive advantage over traditional funding institutions when it comes to ensuring unparalleled user experience. FinTech has reached great heights since the arrival of dynamic apps and online services. Disruptive technologies were the need of the hour and that’s exactly where BI and data analytics came into the picture. Amazon’s popularity, growth, and revenues are results of the user experience it provides to consumers. Needless to say, the company had considered BI integration long ago. Although the performance of the Fintech Industry isn’t that impressive in the US, reports from Asia state a different story altogether. The continent records a total investment of $7.1 billion which is huge and magnanimous. So, BI can prove to be the game-changing force for the Fintech industry if implemented in the right way.